When I plan a kitchen or a bathroom, my first stops are tile showrooms. 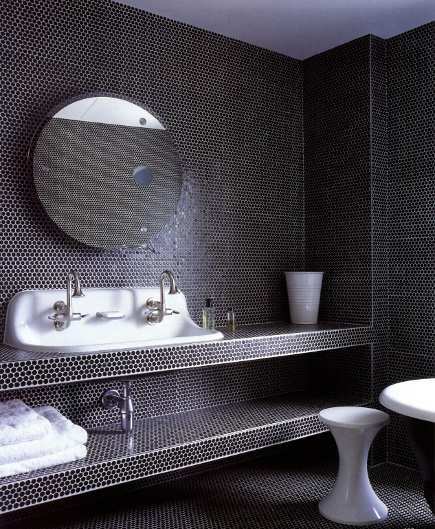 I’ve admitted in the past that I’m a bit of a junkie when it comes to tile – and mosaic tile in particular. One of the highlights of an anniversary trip to Sicily some years ago was a visit to a Roman villa with spectacular mosaic tile picture floors. Those tiny pieces of antique glass used to create scenes from lives lived two thousand years ago were a revelation. I’m also a fan of kitchen and bathroom walls completely covered with tile — especially glass or ceramic mosaics which create dancing light as the day goes by. Nothing can offer more maximum visual impact that these special combinations of small-scale pattern, reflective surfaces and color. 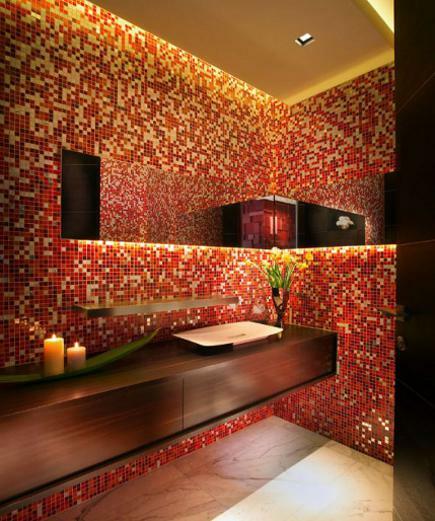 Two full walls of pepper-red glass mosaic tiles are wrapped around a powder room by Miami designer Pepe Calderin, stating the case perfectly. This is an unforgettable bathroom that requires little additional embellishment since the mirror magnifies the effect of the tile. While Calderin’s client paid for more than the usual amount of tile, humidity will never be an issue and little painting or maintenance is required. In a London townhouse renovated for a young family, the owner worked with Ilse Crawford, an eminent British hotel designer. While this third-floor children’s bath is more hipster then tween chic, the black ceramic “rotondo” tiles (also called penny rounds) from Britain’s Domus deliver a childroof (even bulletproof) spa. Some designers might choose a contrasting color for the floor. Here, though, the consistency keeps the focus on the handsome Kohler Brockway lab-style sink with Kohler Cannock faucets brought in from New York. Both the huge round mirror with integral lighting above the sink and the tiled built in storage below do double duty. 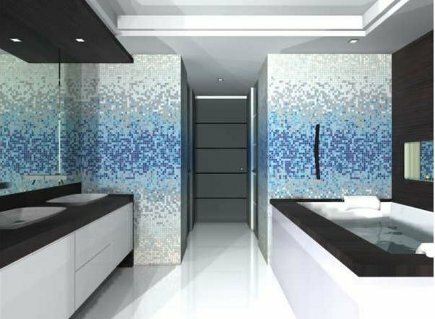 In another Calderin bathroom, a gradiant-color mosaic is used on two walls and extended to a third by its reflection in the huge expanse of mirror. The intense band of color creates something of a horizon line in the room, keeping the look low, sleek and modern but timeless as well. For another Kohler Brockway sink bathroom see Rustic Basin Sinks. As someone who can get tired from too much visual stimulation… Yikes!